This kitchen is smaller in the Chinese edition of the catalog. Photo via IKEA. That fat IKEA catalog that lands with a thud in mailboxes worldwide around this time annually is apparently a massive undertaking that requires tailoring to a global-spanning array of tastes. Sometimes that means cropping photos for smaller kitchens; sometimes that means cropping out the women. IKEA has ethnographers who conduct field research into the domestic life of different regions through home visits, interviews and panels. While the researchers’ “Life at Home” consumer insights researchgoes to the development of new products, it also helps catalogue creators plan the content and styling of local editions. This year, it took the Swedish company 18 months and a hundreds-strong army of photographers, art directors, copywriters, proofreaders, prop masters, carpenters, photo retouchers, programmers and CGI specialists to produce the catalog’s 1,400 pieces of art and 24,000 texts. 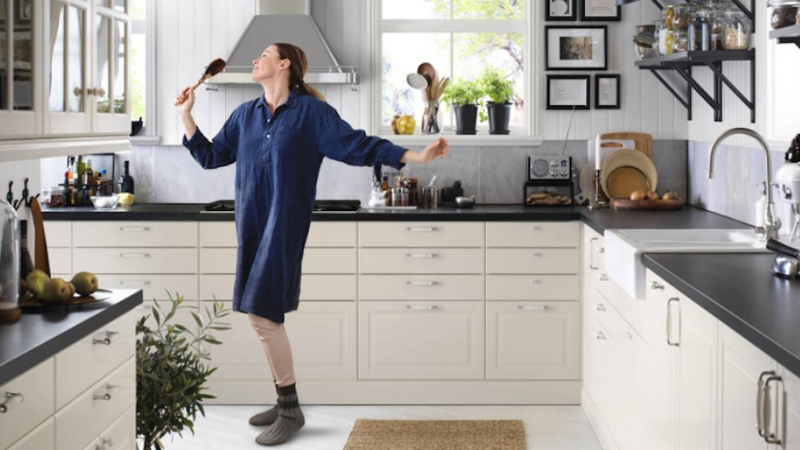 While the text remain basically the same worldwide, IKEA’s team does go the extra mile to swap out subtle, tell-tale details in 72 different region-specific editions. Obviously, there are the price differences—it costs more to get anything to Australia and so their Billy bookcases are presumably pricier. But it’s the littlest touches that are fascinating and weirdly compelling. For instance, China tends toward smaller kitchens than here in the United States, so they do some cropping and post-production rearranging to shrink the catalog’s kitchen spaces, and they’ll swap paneled and plain doors, depending on whether they’re shooting for Americans or Europeans. Sometimes they’ve made more controversial decisions, however. In 2012, IKEA scrubbed the women from the Saudi Arabian edition of its catalog (later apologizing). In 2013, they also cut a lesbian couple from the Russian edition, after the country banned “propaganda of nontraditional sexual relations.” And in February of this year, Israel’s ultra-Orthodox Haredi community also got a special edition tailored for their community featuring sets with visible Talmuds and ultra-Orthodox dress—and again, no women. For more, read the full thing over at Quartz. If anybody’s looking for a viral project in the tradition of “photoshops of beauty from around the world,” it just fell in your lap.